I had no idea when my brother married his wife that I wouldn't just gain a sister, I would also gain the best chocolate chip cookie recipe ever. I love a chewy cookie, but find that most get hard around the edges as they dry. Not these! What is the secret to keeping them soft? Jell-O! Well, Jell-O instant pudding mix, that is. 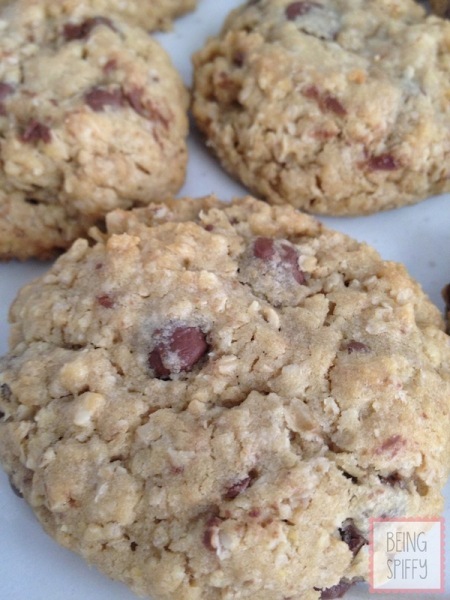 Who would have thought that a dry mix would add so much moisture to cookie dough? But if it works, who am I to question it? I always try to have my kitchen stocked with the ingredients so I can whip them up whenever I get the craving…which is often. They're pretty typical cookie ingredients, minus the vanilla. That's covered by the Jell-O. What also adds to the delicious chewiness is the copious amount of butter and the ratio of brown sugar to white (heavy on the brown!). I always crack my eggs into a bowl and pour them in from there. I've had to dig out too many shells from my dough! Plus, you can put the eggs in one-at-a-time while the mixer is running. Mixture after the eggs and Jell-O. Mixture after flour and baking soda. I always use a cookie scoop to portion out my dough. It's the OCD in me! It always makes the cookies into perfect little balls. Aren't they cute? Because of all the oatmeal, they don't flatten out when they bake. I push them down a bit with my fingers so they cook evenly. Now THOSE are some cookies! And they look just as yummy on the inside! Mmm…don't you wish you had a scratch 'n' sniff monitor? If you store these cookies in a Ziplock bag or Tupperware, they'll stay moist for a week. Not that they'll be around long enough for you to find out! Here's the recipe so you can hop in the kitchen and make your own! In stand mixer, cream together butter and sugars. Add Jell-O and mix until combined. With mixer still running, add eggs, one at a time. Pour in dry ingredients and blend until no streaks of flour remain. 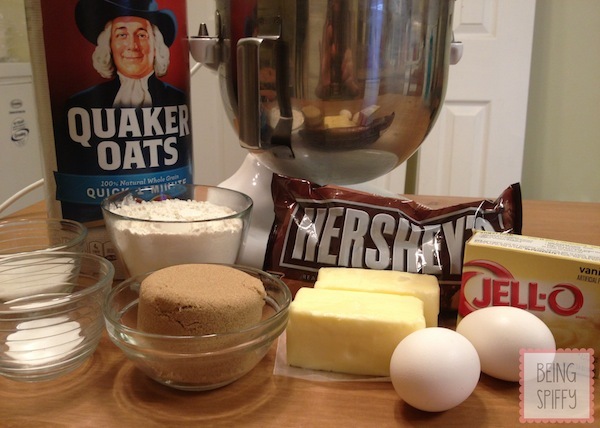 Add oatmeal and chocolate chips. Stir in either by hand or use the "stir" setting on the mixer. Using a cookie scoop, portion 12 pieces of dough onto a cookie sheet. Bake for 12 minutes or until edges just start to brown. Makes approx 2 dozen cookies.